Before pursuing my career in librarianship, I spent several years working as a teacher in preschool, elementary, and secondary education. I have always had a deep love for education, but I found my true calling in librarianship. I am excited to have the opportunity to begin my life an academic librarian. I am elated about the possibility of combining my love of education and my love of information expertise. I live for connecting users to information and seeking out what is difficult for others to find. As Mason (1990) describes, “information professionals empower their clients to understand and to know – as distinguished from the power to will or to feel”. I seek to help others understand information and to provide them with the knowledge necessary to help individuals succeed. I have spent the past three years working towards my MLIS degree at SJSU while working for at Andrew G. Truxal library in Maryland. I have also had the opportunity to work for Hawaii Pacific University’s Meader and Atherton libraries during my time seeking my first master’s in Education at Chaminade University in Honolulu, Hawaii. 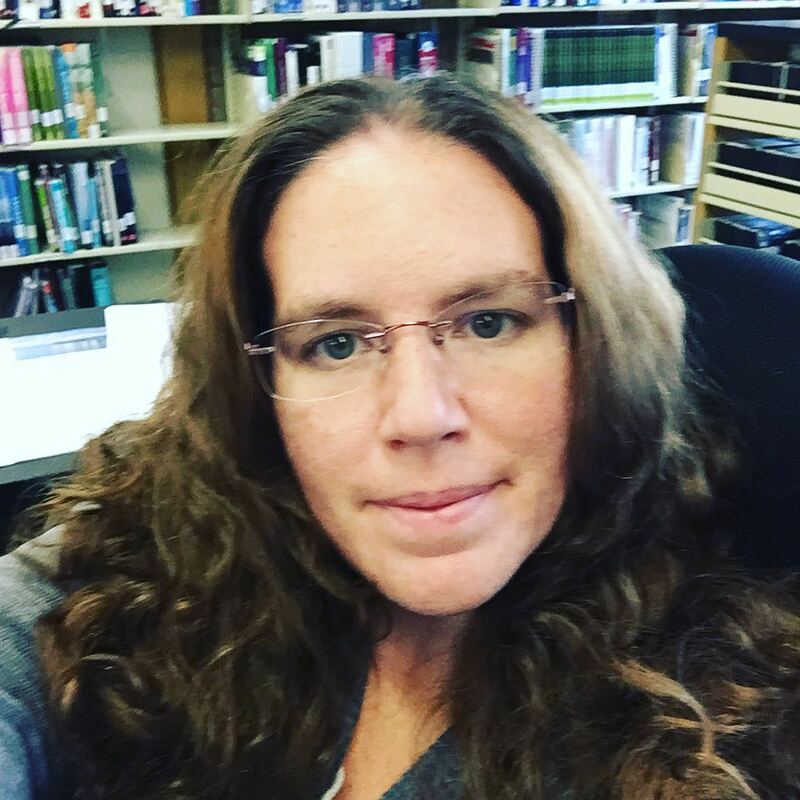 My love for libraries began when I worked for my Feinberg library at Plattsburgh State University during my undergraduate work as a Library Assistant. I have spent the past decade in the library and information science field. My work experience and my coursework in information science has given me invaluable insight into the world of librarianship. My work experiences have allowed me to learn the ins and outs of the information profession from the ground up, assisting on various projects in Periodicals department including large weeding of the print periodical and planning the redesign of the department. I have had experience in Circulation with assisting patrons, training, and supervising the student assistants/ Circulation staff members. I have enjoyed working in academic library environments and assisting students with finding the materials they need to complete their classwork. It inspired me to want to take my career further and expand my knowledge of library and information science. I have always loved reading and searching for information. My undergraduate coursework in English and Education gave me a foundation in the writing process as well as a wide breadth of knowledge on educational philosophy. I have long held a passion for assisting people with their education and working to expand their knowledge on a myriad of subjects. I have a passion for research since my time as an undergraduate student that has just grown over the years. I enjoy working with others and providing excellent service to patrons. I have a love for my work that I believe is infectious to both my coworkers and patrons. As information professionals, we are the gatekeepers of knowledge lighting the way for individuals on their path to understanding. In Mason’s (1990) article, he describes of an information professional as someone who empowers people through the use of information, “this empowering information, as Fritz Machlup once described it, consists of the signs and symbols that one mind uses to influence another mind. Thus, information professionals are the people who carry out this process of influence on the mind”. Information professionals assist in helping people grow their mind and enhance their knowledge. Knowledge empowers individuals and enhances their lives. As an information professional, I hope to provide patrons with knowledge and understanding. I desire to assist individuals to become successful people and knowledgeable global citizens. One of my greatest motivations to become an information professional is helping the students succeed. I enjoy watching them evolve as students and move on to successful futures due to the assistance we have given them. Information literacy instruction and information intermediation allows us to help students think about information before they simply just use or believe what it is they read. One of the most memorable courses I took as an undergraduate was a developmental psychology course in which our professors spend a large portion of the course simply teaching us to identify the validity of the scientific method used in a variety of research. He believed that the most important thing he could instruct us on was not to memorize theories, but instead taught us the skills required to be able to determine for ourselves which theories had validity and which used poor scientific methods or poor scientific reasoning. I have cherished and utilized this skill throughout my life. This is one of the many reasons I believe that information literacy is so important. Teaching students the about not just the scientific processes used in experiments, but the validity of information is an invaluable gift we can give to students of all majors and all levels of society. As the recent U.S. presidential elections demonstrated to our society that understanding the currency, reliability or relevance, authority or audience, accuracy, and purpose or point view is critical to functioning as a citizen. According to Jacobs and Berg (2011) President Barack Obama issued a proclamation stating that “an informed and educated citizenry is essential to the functioning of our modern democratic society”. I believe that part of being an information professional is promoting the love of lifelong learning and educating our citizenry in information literacy skills as Jacobs and Berg (2011) reiterates President Obama’s writing, “I encourage educational and community institutions across the country to help Americans find and evaluate the information they seek, in all its forms”. As our society becomes increasingly global, it is incredibly important to educate our citizens on how to analyze information in all fields. This includes being able to accurately determine if information shared by news sources or social media is accurate or credible. This is one of the main missions and purposes of librarianship and as an information professional, I planned to dedicate myself to ensuring that our patrons become informed and educated for all purposes including personal, social, occupational, and educational. I am a graduate student in the Masters in library and information science program with a concentration in instruction and intimidation. My undergraduate work and my previous graduate work are in English literature and Education. I wish to ensure information and library services are accessible to all individuals. I wish to work in an academic library in instruction and reference services. Although, there are many areas of librarianship that interest me, and I would be excited to explore especially as the information field is expanding due to digital technology. One of my professional goals is to become an academic Librarian who also serves as a liaison between academic libraries, writing centers; disabilities support services, veterans support services, and interdisciplinary fields. I want to expand libraries as part of the academic communities. I want to make libraries more accessible to all types of students and Information Literacy instruction (ILI) more inclusive to individuals with disabilities. I plan to do this by utilizing universal design approaches in ILI to make library services more accessible. I also want to assist with designing and utilizing interfaces that are more accessible to individuals with disabilities. Changing small things like using Sans serif fonts can make web pages or instructional supplements more accessible. Using alternatives to programs like reCAPTCHA, this is a program for protecting websites from spam or bots. For the bot or spam machine to get to the data, they must write the words or letters they view. This can be difficult for individuals with dyslexia and can make library forms inaccessible. Changing our services in small ways can make a large impact on individuals with disabilities. Changing techniques not only in instruction but also in reference services including adding more ways to reach us via email or via virtual conferencing such as Blackboard Collaborate can make services more inclusive. I also wish to study copyright laws in relation to accessibility for people with disabilities, inform libraries of what they can do to help ensure accessibility. I want to advocate for changes as needed to ensure that copyright laws are unnecessarily disenfranchising those with disabilities. I want to ensure that our libguides take in consideration individuals with disabilities as well I have already addressed altering reference interview techniques and libguides to assist individuals with disabilities in competency C and Competency K .
Another goal I have is to increase the utilization of Open Educational Resources (OER) to decrease the cost of textbooks to college students. I created a mock grant for OER resources in my Competency N. I think this is an important need for students today to enhance accessibility and reduce costs of textbooks. I think this can also reduce the cost of materials for libraries if we incorporate more Open resources in our digital collections. I would like to review and evaluate open education resources to ensure they are quality educational resources for incorporation into the curriculum. I would also evaluate these resources for accessibility to individuals with disabilities. I would also like to create open resources for student work donated or which students give permission for the library to use for engineering students such as projects created in makerspaces. My final goal I have is to use makerspaces in an academic library to facilitate the instruction of information literacy. I would like to assess IL instruction using makerspaces on an institutional level and evaluate their effectiveness at teaching IL skills to students. I began a project proposal in competency L for evaluating makerspaces used for ILI using portfolio assessments. It is my professional goals to make libraries more inclusive and accessible to individuals with disabilities. In the future, I hope to aid making interfaces more accessible to individuals with disabilities and evaluate open educational resources to ensure accessibility to all types of users. I wish to encourage lifelong learning and information literacy skills for all patrons. I wish to encourage the seeking of information in all its forms and be a catalyst for creating an informed and educated society. It is my professional goal to evaluate programs, collections, and services to ensure they effectively meet our user’s needs. It is my goal to create a culture of inclusion and to be a devoted social justice advocate. I hope to contribute to the profession of librarianship by bringing my knowledge and skills that I have learned through my time at SJSU to enhance the information organizations that employ me in the future. Throughout the process and progress of my Masters in Library and Information Science at SJSU I have learned about so many varieties of information professionals and information organizations. I have expanded my skill sets exponentially and have a deeper understanding of modern librarianship. I think that the ischool’s virtual program is ideal for learning librarianship in this digital era as our world becomes increasingly interconnected via digital means and our users frequently turn to virtual means to seek information and assistance. I entered the MLIS program in the fall of 2014 with a vague understanding of everything that librarianship entailed. I focused my coursework in areas of interests, in courses to expand my digital skill sets, and in coursework that would fill my gaps in knowledge. Exploring the many facets of librarianship has been fascinating and has ignited my passion for working in this exciting field. Wearing the many hats of an academic librarian may seem exhausting to some, but I welcome the opportunity to have a career that has so many different aspects. It is a demanding field and I look forward to what careers may be in my future. I have enjoyed collaborating with groups virtual and would have never thought it would be so rewarding. I have learned so many new technologies and techniques related to librarianship. I have enjoyed the peer reviews and the discussion posts in the coursework they have really given me a better sense of how many types of libraries operate and address user’s needs. Hearing classmate’s perspectives on topic expand and challenge your own viewpoints. My classmates have been invaluable assisting to accumulating myself to technologies used in the course and to returning to graduate school after a long hesitates. I have had some challenging professors and some extremely rewarding feedback that assisted me in my growth as a student. The knowledge I have gained during my graduate coursework will be invaluable to my future success. I have progressed so far from the stumbling returning student to the confident and capable graduate student. I have seen my abilities develop greatly during my time as SJSU and I am grateful that I was able to have the opportunity to attend this program. This program has made me realize new strengths that I did not know I had previously. knew that I had a strength in instructing others and organization from my previous experiences as an educator, but I did not realize that I had other strengths applicable to the field. Having never participated in organizational analysis or strategic planning I did not know that I would enjoy it so much or that I would have a knack for planning and analysis. This program also highlighted my customer service driven approaches to the information profession and my creative problem-solving abilities. Creative problem-solving is vital to help libraries stay relevant in this fast-paced and ever changing digital society. In this digital age and smaller budget means that information professionals are taking on more tasks within information organizations. Information professionals are often many different things at once such as instructors, liaisons, managers, copyright experts, and reference personnel. Having the knowledge and training to take on multiple jobs within a library can be useful even in the best of times it allows for flexibility to assist your information organized in various department and can make you a valued employee with many capabilities. Information professionals need to be able to create solutions to new problems that are created as technology expands being able to invent solutions and create new services will help to keep libraries relevant in the digital age. Envisioning libraries as not just information storage, but also for information creation will expand our services into the future. Customer services has always been extremely important to me besides truly loving my field and passionately loving finding information. I have always believed that libraries need to be customer service focused. A patron first approach that seeks to put the needs of our users in an attentive and friendly manner. Being friendly and coming up with a multitude of ways to address a user’s needs can go a long way to creating a service orientated environment. Going beyond their expectation to try to connect a user to the information they need. Information professionals need to demonstrate to users their value by giving them what Google cannot in the sense of service and instruction. Good listening skills and asking clarifying questions to determine what resources a user needs to answer their needs. Asking for feedback and following up to be sure that you were able to meet their needs is invaluable. Information professionals that are always ready to help and treat our patrons with kindness keep users returning to libraries for their information needs. We need excellent people skills to draw users in and elicit recommendations of our services to other potential users. Planning and analysis, I had never really considered my ability to plan and evaluate as a strength. I have always been a list maker and a planner of events for my family, but I never consider these in strengths as having professional applications. I have created lesson plans and curriculum during my time as a teacher. I just didn’t realize that I would be good at organizational planning and analysis. I truly enjoyed strategic planning creating SMART goals and metrics for evaluations was deeply interesting to me. When we were developing goals and evaluation in our course I noticed in the discussion posts the compliments and requests for advice that I received from my classmates. Planning collection development to determining the Strengths, Weakness, Opportunities, and threats of an organization came very naturally to me. I enjoyed analysis information to determine the gaps in services and areas of weakness in a collection. I hope to be able to apply these skills in my future employment because I think they are invaluable skills to improving information organizations ability to meet their patron’s needs. I plan to participate in internships to further expand my abilities in virtual and in-person reference skills. I also plan to continue to seek out professional development courses through my current employment to enhance my skills in librarianship. I plan to teach instructional courses in information literacy. I plan to continuously seek out opportunities for growth and to continue to enhance my professional skills. I also plan to further my education in this field by pursuing my doctor in Library and Information Science. I plan to work in an academic library environment and continue to promote library services to the community. I plan to develop professional development course on serving individuals with disabilities in the library. I will continue to seek out mentors in the field to help me develop my skills in librarianship. I think it is vital to continue exploring and studying new ways to improve library services and to continue being part of the conversation about cultural and technological changes. I will continue to seek out ways to improve services and access for all our users. I envision assisting in increasing the use of open education resources to lower the costs of textbooks for students and to expand our collections. I also plan to work towards libraries creating their own unique collections that will offer their students information or collections that are not accessible from competing sources of information. I also hope to work on digital humanities projects that will help to expand the field of humanities into the digital era. I seek to keep the humanities relevant while promoting STEAM initiatives. Students at SJSU ischool need to demonstrate the ability to evaluate programs and services using measurable criteria I take this competency to include an information professionals ability to assess instruction practices, program assessments, usage surveys, data gathering and analysis practices for the purpose of improving products and services in information organizations. In my background as a teacher and education, I have often had to use measurable criteria to develop student-learning outcomes and evaluate instruction for effectiveness. However, my coursework at SJSU gave me the opportunity to enhance those skills and to apply them to information literacy, evaluating programs, and library services. The evaluation process in information organization can encompass a myriad of elements due to the broad and interdisciplinary nature of Library and information science. In the assessment process, an organization must according to Radcliff (2007), “gather data, analyze & interpret, plan for improvement, share data & plan, and implement the plan”. Information organizations are often services oriented and goal driven as with many service-based business information organizations planning is required to keep performance at an optimal level. Information organizations need to be certain they are maintaining quality customer-service standards and providing the services that their community needs. Evaluating our services, performance, practices, information literacy instructions, and our collection to ensure it is in line with the needs of our patrons is imperative to being a valued part of the communities in which information organization operate. Information organization, for example, academic libraries often operate under the larger umbrella of institutional goals, missions, and values that they must align themselves with when considering their own goals. Organizational goals are often complicated and change over time as the populations they serve and the resources on which they rely upon change. Underneath main goals, there are often more short-term goals such as increasing the number of attendees at a particular event or reaching a circulation usage benchmark. In order to determine if short-term goals or long-term goals were met, they need to evaluate. Creating clearly defined and measurable goals aid the evaluation process easily determine what success looks like for the program or service were evaluating. The organization must perform assessments to determine how effectively each goal was addressed and if the changes implemented made an impact on the environment or community in which the information organization operates. As Evans & Alire (2013) state the goal of assessment is often to “improve the quality of our operations, services, and programs”. As information organizations, we want to operate optimally within often times constrained budgets while still providing the best possible facilities, programs, and services to our community. Assessment is important to creating and maintaining high standards and improving an organization. Doing assessments regardless of whether it is on how well our ILI programs implement ARCL frameworks to how well our libraries serve teen populations information professionals must choose the appropriate tools for gathering information and criteria for determining success. In organization planning, the evaluation process should begin with measurable goals and in instruction; student-learning outcomes should be clearly defined and measurable. Instruction should also begin with some benchmark or prior skills assessment to determine what skill levels students began instruction with and an assessment for measuring how those skills changed or did not change due to instruction. The assessment process also can assist in as Radcliff (2007) points out, “identifying the gaps in our instruction and informing us as to what we can do to improve our instruction”(p. 11). Once the gaps in knowledge are identified, a plan is implemented to address those gaps. Some gaps can be easily identified or are observable such as not having enough study room for students and some are more difficult to ascertain such as are we meeting the information literacy needs of our students. Formative assessment: in process; progress along the way; development Examples: In-class exercise or reflections on the process of learning. Summative assessment: the final result; adding pieces of information together to get a sum Examples: final exams, surveys at the end of the course, reflection components of portfolios summarizing the value of a project. Director authentic assessment: Characterizes assessment that is a result of direct contact with a student. This could be a product, such as a search strategy developed by a student in class, or a portfolio of student work, it also includes tests, annotated bibliographies, and papers. Indirect assessment: Characterizes assessment information that has been inferred from observation or from surveys. It is subject to interpretation and relies on inferences. My first piece of evidence is my assignment 8 from my INFO 282 course on Grant Writing and Alternative Funding Resources this assignment was to find a grant or mini-grant to either create a mock grant proposal as though you were a grant writer for a client in this assignment my client was a community college library. This grant proposal would include a letter of introduction, proposal summary, Organization overview, Statement of needs, Project description, Approach/methodology, budget requestion, evaluation process, and an appendix of any additional documents needed for the grant. For this assignment, I chose to create a proposal for a grant put out by the University of Maryland to assist with gaining Open Educational Resources to make textbooks more affordable for college students. In this project, I create an evaluation for determining if we successfully implemented the grant and for measuring and evaluating the success of utilizing the Open Educational Resources. I included this assignment as evidence of my ability to evaluate programs and services using measurable criteria. My second piece of evidence is my extra credit assignment from my INFO 282 course on Grant Writing and Alternative Funding Resources. This was an extra credit presentation option that allowed students to present on a topic related to grant writing. The topic I chose for this presentation was working with grant clients on evaluation metrics. I noticed that a majority of my classmates struggled with creating evaluation metrics in our discussion posts for that unit. I chose to do a presentation on skills related to creating evaluating metrics. I included this presentation as evidence of my ability to effectively measure and evaluate programs and services using measurable criteria. My final piece of evidence is my assignment #3 from my INFO 285 course on Research Methods in Library and Information Science Topic: Assessment of Information Literacy Instruction. This assignment asked students to create an assessment design project: Students will develop a small information literacy assessment tool for their user group (identified in the literature review) including writing learning outcomes. I chose to create a rubric to assess student e-portfolios generated from library and information literacy instruction taught in academic library settings. I used performance assessment techniques to determine if information literacy skills improving when ILI utilizes makerspaces. Evaluating the services and instructional programs are crucial to making improvements to any institution. Using metrics for that evaluation that are measurable is important to ensure that improvements are occurring and that the correct changes are being made to meet the needs of our users. Understanding the evaluation process including how to utilize its tools and how to implement measurable criteria into an evaluation process is invaluable knowledge for information professionals. Information professionals can not improve services if we do not assess how effectively changes is implementing change and determine if that change was effective in addressing the gaps in service or knowledge. Information organization needs to perform optimally in order to stay competitive in this digital age and one way we can do that is by participating in the continuous evaluation of our services, programs, and practices. I enjoyed learning various evaluation tools and improving my ability to implement assessments for a variety of purposes. My time as SJSU has given me a great understanding of the assessment cycle as it applies to information organizations and it has broadened my understanding of assessment. Providing excellent service to patrons is of key importance to me and this knowledge will be applicable in my future as an information profession in a multitude of ways. Evans, G.E. & Alire, C.A. (2013). Management Basics for Information Professionals. 3rd Edition. Chicago: Neal-Schuman. Radcliff, C. J. (2007). Practical Guide to Information Literacy Assessment for Academic Librarians. Libraries Unlimited Incorporated. As information professional communication is a key skill to possess because so much of being an information professional is related to the dissemination of information. This requires at its most basic and inherent level a need for the ability to communicate effectively. Information professionals need to be able to talk, listen, read, and write to fulfill our most fundamental job requirements. An information professional positions exist to provide,” the right [objectified] information from the right source to the right client at the right time in the form most suitable for the use to which it is to be put and at a cost that is justified by its use”(Mason, 1990, p.124). Connecting users to information is a major component of being an information professional. Understanding that a user seeks assistance from an information professional because they have an information need. An information professional, “has the requisite knowledge about and access to the sources necessary to acquire this information” (Mason, 1990, p. 126). It takes effective communication skills to impart the knowledge that information professional possesses to users who need the information and access to obtain knowledge. With whom am I communicating? When we stop to ask ourselves these questions prior to communicating with others we can improve the effectiveness of our conversations with others. When we take time to actively listen to others when they are communicating we become more effective and responsive managers. Listening effectively allows staff members to be feel heard and understood. Evans and Alire (2013) assert that, “There is a significant difference between hearing and listening. Listening is a skill that you must practice to develop it effectively”. This is an important skill to managing individuals in libraries so that complaints and ideas can be heard and considered. Communication and listening efficiently also helps to make staff members feel valued and understood. Communication is also important when working collaboratively, as a liaison between departments or organizations, and negotiating with vendors. These types of communications can impact a libraries operation, funding, expansion, and access to resources. These are vital aspects of the information profession that can affect users, staff, stakeholders, and community members. Unclear or poorly written reports given to a library board of directors or institutional administrators can mean the difference between receiving necessary resources or risk appropriation of resource to other departments or organizations. Information professionals need to be able to clearly communicate and add meaningful contributions to information exchanges. As information professional needs to able to hear a patrons request, ask clarifying questions to gain an understanding of the information need, to disseminate information, and check with the user to ensure that the answers meet their needs. These are all important components of communication and feedback. Bell (2015) reiterates Robert Taylor’s quote that, “Without a doubt, the negotiation of reference questions is one of the most complex acts of human communication. During this process, one person tries to describe for another person, not something he knows, but rather something he does not know”. In order to conduct reference interviews either face to face or virtually information professionals must have excellent professional oral and written communication skills. to apply the theories learned about throughout the course. My partner and I collaborated to create the tutorial both contributing to the creation of the tutorial adding quiz questions equally. The tutorial was a collaboration of a database she was utilized frequently and a subject matter that was familiar to me from my work experience. This assignment is included as evidence of my ability to communicate effectively and work collaboratively. My second piece of evidence is my personal skills teamwork assignment from INFO 203 course on Online Learning: tools and strategies for success. Students in this course were asked to work in small teams to create a list of ground rules that a team could use to organize their work. The teams were asked to determine team roles, create a short list of ground rules that a team could use to organize its work, and complete a personal reflection on the group work process including their assigned role on the team and how the work was completed. My position in this team was the team leader as the group leader I facilitated the assignment of roles and creation of the ground rules for the team. I included this assignment as evidence of my ability to communicate effectively and collaborate professionally with other information professionals. My final piece of evidence is my group D progress report from my INFO 204 course on information professionals. In this assignment, the groups were to collaborate in Blackboard Collaborate sessions to complete a group project. This assignment required the group to choose roles, create ground rules, create a timeline for work completion, to define the roles and responsibilities of each group member, to choose an organization to analyze, and consider the challenges related to working in a virtual group. In this group, I served as the editor and assistant writer for the group. I included the written assignment as well as recordings of our group collaboration to demonstrate my ability to communicate professionally using both oral and written skills to complete a group project. I think one of the most beneficial aspects of returning to graduate school after a long break was the group work. Working collaboratively via virtual means gave me a better understanding of the varying skills necessary to perform group work virtually in differing time zones and from diverse backgrounds. SJSU has given me in general during my time a better understanding of professional communications and teamwork skills. I have enjoyed the update on my communication skills and development of new skills appropriate for the virtual world that we live and work in on daily basis. My coursework has enhanced my skills and approaches to committee assignments. My years of experience teaching and assigning group work in my classrooms demonstrated to me the importance of group collaboration on projects. However, working in groups on a professional level to complete assignments virtually provided me with all new types of communication and technical skills needed to complete assignments as a group. I found these experiences rewarding and I believe that my skills are much improved due to becoming more deliberate in the use of communication techniques and methods. My time at SJSU has given me a better understanding of the processes behind professional communications and has developed my skills in this area in a multitude of ways. Bell, S. S. (2015). Librarian’s guide to online searching (4th ed.) [Kindle DX version]. Evans, G.E., & Alire, C.A. (2013). Management basics for information professionals. (3rd ed.). Chicago: Neal-Schuman. Students in SJSU Ischool’s graduate program must be able to demonstrate understanding of quantitative and qualitative research methods, the ability to design a research project, and the ability to evaluate and synthesize research literature; in order to demonstrate their grasp of information sciences, their preparedness to become an information professional, and to prove that they have a firm grasp of this core competency. Information professionals need to be able to perform research for many purposes such as for improving collection development, assessment of information literacy instruction, assessment of library services, and even to gather information for the physical design of library spaces. Understanding the multiple types of research methods that exist including quantitative, qualitative, and MMR (Mix Method Research) are necessary to conduct research in the field of library and information science (LIS). LIS is an interdisciplinary field where many of topics information professional research cross over into other disciplines. Research is essential to the growth and development of the LIS field. Information professionals need to be familiar with the strategies and techniques of research that they might encounter or need to utilize when conducting research in the LIS field, “MLS students need exposure to a wide range of methods given the wide range of professional contexts in which future research may be carried out or encountered”(Hider & Pymm, 2008, p.108). It is important to understand the methods of research to effectively further innovations and services in the field of LIS. Information professional, especially in these increasingly digital times, need to contribute to the research and development of innovative approaches to assist LIS field to remain relevant and to rely on evidence-based practices to solve problems. Information professional also need to be able to design research for evaluating library services, developing better information retrieval systems, designing better techniques for streamlining information, designing higher quality user interfaces, refining instructional theories, and techniques for Information literacy instruction. The need for research and application of research within the LIS field can be endless especially due to the multidisciplinary nature of the field. The LIS field can also make it difficult to conduct research and to apply appropriate research methods due to the interdisciplinary nature of the field, “The problem is that LIS is a very broad discipline, or meta-discipline, that uses a wide variety of continuously evolving strategies and techniques”(Hider & Pymm, 2008, p.108). As information professionals, we need to understand a wide variety of research methods to carry out research in our field and to assist many disciplines in conducting research. Information professionals need to understand both qualitative and quantitative research methods to be able to apply them relevantly to research projects being conducted in the field of LIS and in the disciplines that the LIS field crosses over. Information professionals need to be able to design research projects and utilized effective research methods to conduct research that can further the field of Library and Information science. They also need to understand the various types of research including quantitative and qualitative research in order to choose the optimal type of research methods for designing their research projects. According to Leavy(2017), Quantitative research uses, “deductive approaches to the research process aimed at proving, disproving, or lending credence to existing theories. This type of research involves measuring variables and testing relationships between variables in order to reveal patterns, correlations, or causal relationships”. When deciding what type of research method would work best it is important to keep in mind the purpose of the research, the questions needed to determine the answers, and the type of data that is needed to answer the question or solve the problem related to the research. This can help information professional determine which approach would be most effective for the research they are carrying out or allow them to assist other researchers in determining the best methods to carry out their research. Some types of research questions or problems call for quantitative analysis using carefully gathered and structured data such as questions about data usage or questions about how specific user groups utilize library resources. Others demand qualitative methods, using unstructured data such as interviews or open-ended survey questions; to gather information on user’s behaviors or information needs. For instance, quantitative research can be most applicable when, “quantifiable measures of variables of interest are possible, where hypotheses can be formulated and tested, and inferences drawn from samples to populations”(Connaway & Powell, 2010). When information professional research subject areas that require experimentation to test a hypothesis are in line with quantitative research methods. However, qualitative data can be most useful for determining why some individuals or groups do not use library services and how patrons react or respond to library events or workshops. “Qualitative research is generally characterized by inductive approaches to knowledge building aimed at generating meaning. Researchers use this approach to explore; to robustly investigate and learn about social phenomenon”(Leavy, 2017. p.9). Qualitative data can be gathered in many ways such as case studies or participant observations. “Qualitative research focuses on attempting to understand why participants react as they do. Qualitative research tends to apply a more holistic and natural approach to the resolution of a problem than does quantitative research”(Connaway & Powell, 2010. p. 41-42). This type of research can assist information professionals in understanding how various human behaviors and reactions related to the library and information sciences field. When designing research projects and choosing the type of research that is required for your topic it is important to consider the type of data that will be gathered using research methods. According to Grassian and Kaplowitz (2009),” formal research studies (i.e., comparing instructional methodologies, assessing the long-term effectiveness of your instruction) or for justifying your ILI programs, courses, or classes to your supervisor, administrators, or beyond you may need to collection numerical data that can be statistically manipulated”. In order to conduct research information professionals, need to be able acquainted with data collection methods and data analysis techniques, tools for collecting various types of data. Numerical data or quantitative data allows information professionals to demonstrate data numerically so that trends can be readily identified. Quantitative data can be an effective method to measure library usage e.g. circulation trends, amount of materials checked out, database usage, number of virtual reference questions, or to monitor foot traffic in the physical library. Tracking these trends over time can be revealing to understanding trends in the LIS field such as information trends or service usage trends. It is also important to remember however that as stated by Grassian and Kaplowitz (2009), “qualitative data can be turned into quantitative data through content analysis and well-developed rubrics”. If you are working with a subject matter that is difficult to measure numerically, but to which quantitative data is needed for stakeholders that data can be coded or use of tools such as rubrics can be helpful in transforming data. This is especially applicable to the area of information literacy instruction. Some of the most common types of research methods are content analysis, questionnaire, interview, experiment, and bibliometrics. In Hider and Pymm (2008) study suggested that while researchers in the LIS field employed a wide variety of strategies, they mostly used surveys and experiments, but they also observed that although quantitative research accounted for more than 50% of the articles, there was an increase in the use of qualitative methods in LIS research. Research can also incorporate multiple types of methods to effectively carry out research. “Mixed methods research (MMR) employs a combination of qualitative and quantitative methods” (Fidel, 2008). MMR can be useful in LIS field because of the interdisciplinary nature of the field it can be helpful to utilize multiple methods to research areas of the discipline that crosses over into other fields. It can also help a research gain a well-rounded understanding of the subject of their research. “the motivation to mix methods in research is the belief that the quality of a study can be improved when the biases, limitations, and weaknesses of a method following one approach are counter balanced, or compensated for, by mixing with a method belonging to the other approach” (Fidel, 2008). Using MMR can be a comprehensive way to ensure the validity of the research and to thoroughly approach solving a problem or answering research questions. The complexity of the LIS field requires future research to use increasingly diverse methods of research to help the LIS field conduct research that can help progress the field into the future and created more evidence-based practices for information organizations. The greater understanding information professionals possess related to research methods the more they can engage in scholarly conversations and exploration related to their field. Understanding research method is also critical to aiding information professionals in assisting patrons with their research and selection of research tools or literature needed to complete research in their field of study. My first piece of evidence is assignment number one from my INFO 285 course on Research Methods in Library and Information Science Topic: Assessment of Information Literacy Instruction. This assignment required students to create an outline of an information literacy assessment project that the students wish to undertake. I chose to undertake assessing information literacy instruction utilizing makerspaces. In this assignment, I outline the project proposal for my information literacy assessment. I included this assignment as evidence of my ability to design a research project. My second piece of evidence is Assignment 4 from my INFO 285 course on Research Methods in Library and Information Science Topic: Assessment of Information Literacy Instruction. This assignment required students to develop a completed research proposal incorporating elements (and revisions) from earlier assignments. I chose to create a proposal for assessing information literacy instruction utilizing makerspaces in academic libraries. I included this as evidence of my ability to design a research project and demonstrate my understanding of qualitative and quantitative research methods. My final piece of evidence is my research paper for INFO 200 Information Communities. This assignment asked students in INFO 200 to choose an information community to research. Students were asked to explore this information community and write a graduate-level research paper on this community. Students in this course were required to identify an information community to examine, locate and critically evaluate the scholarly and professional literature relating to that community’s information-seeking behavior and needs, gather additional data about your users’ information practices and preferences from community-based resources, and summarize the results. I chose to research the information community of parents of children with Autism Spectrum disorder. I included this assignment as evidence of my ability to evaluate and synthesize research literature. Information professionals need to have an understanding quantitative and qualitative research methods, the ability to design a research project, and the ability to evaluate and synthesize research literature so that they can facilitate research, assist researchers in utilizing research methods, comprehend complex research practices, demonstrate how to use research tools to library users, and carry out research related to the LIS field. In order to contribute to the LIS field information, professionals must be able to use research methods to carry out research or properly collect data to justify library programs or services to stakeholders. Research is a major component of many positions within the information professions and information professionals need to demonstrate an understanding of research methods and synthesizing literature to effectively perform as information professionals. Information professionals need to understand how to synthesize literature effectively before we can instruct library users on synthesizing information ascertain from literature. Fidel, R. (2008). Are we there yet? : Mixed methods research in library and information science. Library & Information Science Research, 30, 265-272. Grassian, E. S., & Kaplowitz, J. R. (2009). Information literacy instruction: Theory and practice(2nd ed.). New York: Neal-Schuman. Radcliff, C. J. (2007). A practical guide to information literacy assessment for academic librarians. Westport, CT: Libraries unlimited,u.s. Students in SJSU Ischool’s graduate program must be able to design instructional programs based on learning principles and theories; in order to demonstrate their grasp of information sciences, their preparedness to become an information professional, and to prove that they have a firm grasp of this core competency. I have taught elementary school for many years and my first master’s program was in education. Throughout my years of teaching and my education, I have learned a lot about the principals and theories behind instruction as well as instructional design for works well for students. Utilizing effective pedagogy in instruction is essential for ensuring student success and expanding our student’s knowledge base. 2. Provide Multiple Means of Expression (the “how” of learning). As instructors and teacher many of these principals come naturally as part of instruction. Incorporating this design approach to is not only inclusive of individuals with disabilities, but is effective for all learner. This approach is easily integrated into information literacy and works in collaborating with the ACRL’s framework for Information Literacy for Higher Education. This type of instruction allows all learners to have equity of access to education. As an instructor ensuring equitable access to instruction is essential to ensuring that all my students can not only engage in the learning process, but be successful learners. I also utilize the constructivist approach to teaching and instruction because I believe in the importance of students’ ability to construct knowledge through active investigation. Booth (2011) describes constructivism as a style in which, “learners create meaning from their environments by interpreting them through personal attributes, values, and perceptions. Literally, individuals construct knowledge by building their own context for the information they encounter”. This approach to learning is often used by modeling behaviors and giving students the tools they need to construct knowledge through hands-on approaches to instruction. I believe it is important to facilitate learning to students, but they learn more from problem-solving approaches where they demonstrate the ability to construct knowledge from instruction. Giving students the tools to make the connections and guiding their learning through by giving guidance not answers to their problems. Learners developing critical thinking skills and allowing them to build knowledge, “in constructivism the evidence of learning is not necessarily in behavioral change, and much of how we learn occurs through observation, translation, and imitation (mimesis, socialization, and modeling)”(Booth, 2011, p. 62). I believe that constructivism is especially applicable to information literacy instruction and is also in line with the ACRL’s Framework for Information Literacy for Higher Education . Incorporating the ACRL’s frameworks into information literacy instruction is key to ensuring that the necessary information literacy skills required to navigate this age of information overload due to the increased ability to create and disseminate information. The boundaries to accessing information have increasingly lessened in the digital era and with the increased ability to quickly spread information or misinformation globally has increased the need for information professionals to be able to instructor information user in information literacy skills that are applicable in the information age. Although these tend to be the main types of theoretical approaches I have utilized in instruction it’s important to understand and be acquainted with many approaches, practices, and theories related to instruction to ensure that you are providing effective information literacy instruction and utilizing the best techniques to enhances student learning. As Grassian and Kaplowitz (2009) states, ” effective instructors remain flexible and are willing to mix and match various techniques as needed”. Being responsive and aware of students needs and adapting instruction to fit those needs is what makes an effective instructor. Understanding that there is no one approach to instruction that is perfect or ideal all instructional theories have drawbacks. As an information professional, it is necessary to consider methods of learning and the learning needs of our students to effectively apply instructional theories to information literacy instruction. Only as effective instructors will we as information professionals are able to assist individuals in being able to effectively use and evaluate information. As information professional instruction of information literacy is an important aspect of the profession that is growing and expanding in competencies due to the new complexity of information availability that exists in the digital era. The need for our society to enhance it’s critical thinking skills in relation to information literacy has never been more prominent as in these times of misinformation and “fake news”. The demand for information professionals to be effective and engaging instructors capable of teaching critical thinking skills to students and influence society to use information literacy skills to evaluate the information they encounter has never been more evident. Recent events in U.S. history related to the Presidential election have highlighted the need for information literacy skills in this country. Information professionals need to be able to design instructional programs based on learning principal and theories on information literacy to effectively educate students on these essential critical thinking and evaluating skills related to information literacy. My first piece of evidence is from my INFO 250 course on Design and Implementation of Instructional Strategies for Information Professionals. Students in INFO 250 were asked to design a lesson plan related to information literacy with student learning outcomes based on ACRL’s framework for information literacy for higher education. For this assignment, I created a lesson plan on the spread of misinformation on social media directed to community college students to help educate them on information that is distributed via social media. I included this as evidence of my ability to design information literacy instruction based on ACRL framework and is design utilizing evidence-based instructional theories and principals. My second piece of information is my learning activity 5 from my INFO 254 course on Information Literacy and Learning. Students in INFO 254 were asked to describe how you will evaluate your instruction to improve it for the future: Formative Evaluation is your intention for evaluating your instruction. Students were asked to use Learning Activities 1 through 4 create a final instructional design plan for a short course/workshop/tutorial. The intention of LA5 and LA6 and LA7 was to simulate the process of pulling a proposal/instructional design plan together into a coherent document that will be used to share with stakeholders for review, revision, and/or approval. In learning activity 5 I created a professional development workshop on marketing library services using Piktochart for a small community college library. In my assignment, I described the learner characteristics, materials, instructor, instructional goals, entry behaviors, learner outcomes, learner motivations, learn participation, extent materials, a rubric for testing/ assessment, follow-through activities, instructional outlines, and a formative evaluation for my workshop. I included this assignment as evidence of my ability to use instructional theories and learner principals to design an instructional workshop for information professionals and library staff members. My third piece of evidence is my guide on the side tutorial for INFO 254 course on Information Literacy and Learning. In this assignment, students were asked to create a tutorial for information literacy using Guide on the Side tool to create a libguide. Students were asked to consider learner principals and instructional theories in the creation of their tutorials. My partner and I created a libguide for using CINAHL Headings when searching in EBSCO’s CINAHL database. We describe the theories related to designing virtual tutorials and instruction. We utilized these theories in the creation of our online tutorial for students. I included this as evidence of my ability to use instructional theories and learner principals to design an instructional to design on an online tutorial for an academic library for medical or nursing students to utilize. My final piece of evidence is my Learning activity number 7 for my INFO 254 course on Information Literacy and Learning. The learning activity 7 assignment is the final product of my instructional workshop. Students were asked to use Learning Activities 1 through 4 create a final instructional design plan for a short course /workshop /tutorial. The intention of LA5 and LA6 and LA7 was to simulate the process of pulling a proposal /instructional design plan together into a coherent document that will be used to share with stakeholders for review, revision, and/or approval. In learning activity 7 I developed a professional development workshop on marketing library services using Piktochart for a small community college library. In my assignment, I described the learner characteristics, materials, instructor, instructional goals, entry behaviors, learner outcomes, learner motivations, learn participation, testing/ assessment, follow-through activities, instructional outlines, and a formative evaluation for my workshop. I included this assignment as evidence of my ability to use instructional theories and learner principals to design an instructional workshop for information professionals and library staff members. I also included my screencast for my proposal for a professional development workshop. Information has become more accessible, information dissemination has become less complicated and quicker, and information creation has become increasingly available to all types of users with these changes to information comes increasing confusing for information seeker. The mass availability of information has increased the need for an information literate society and thus increased the need for information professionals with knowledge of instructional practices and approaches in order to educate our increasingly global society in information literacy skills that are relevant to the digital world of information. Booth, C. (2011). Chapter 4: A crash course in learning theory. In Reflective teaching, effective learning: Instructional literacy for library educators. Chicago, IL: ALA Editions. Burkhardt, J. M. (2016). Teaching information literacy reframed: 50 framework-based exercises for creating information-literate learners. London: Facet Publishing.